In all fairness, we know this is good wine, but when you open a bottle with a tainted cork. . .it’s not pretty. Everything we’ve read about and tasted from this winemaker has been lights out beautiful and delicious–until tonight. The musty smell hit us from the second we popped the cork. A quick sniff of the cork confirmed that it was probably the culprit. Unfortunately, when a cork is tainted, the wine is as well, and we gave it a couple of shots with clean glasses and extra air time. You can’t make a wine taste better when it’s been compromised. We couldn’t get the fruit or the essence of the grapes. . .which really stinks because we were looking forward to trying the third installment from the Goldschmidt family of wines. 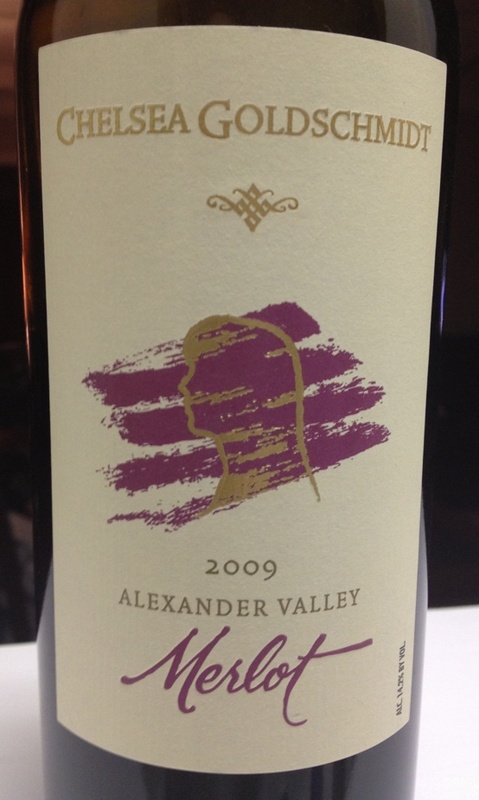 Having previously tried the Kathryn and Hilary Goldschmidt wines, we were excited when, on a recent trip to H-E-B, we found 2009 Chelsea Merlot and it was on sale. Priced right at $20 a bottle, it was at our upper end for blogging purposes, but because of previous experiences, we knew that we were getting a good wine. When you combine a 2009 vintage with an Alexander Valley heritage and a great winemaking family name, you can’t help but get excited at the prospects. So, disappointed is the order of the night. This wine should have displayed black cherry and spice as well as having a nice balance of wood from the barrel. It was missing. We know that this wine is 100% from one vineyard and made with the utmost care. But, it didn’t happen with this bottle. Everything about this wine should have been lights out, but because of a cork that — for whatever reason — wasn’t good, it spoiled the whole bottle. So, we conclude tonight a little bummed out, but hopeful that tomorrow brings another opportunity to try something new. We’re still huge fans, and it’s almost impossible to tell you’ve got a tainted cork until you open the bottle, so it’s not like something like this happens everyday, but let’s try again tomorrow! Categories: Uncategorized | Tags: Chelsea Merlot, Goldschmidt winery | Permalink.